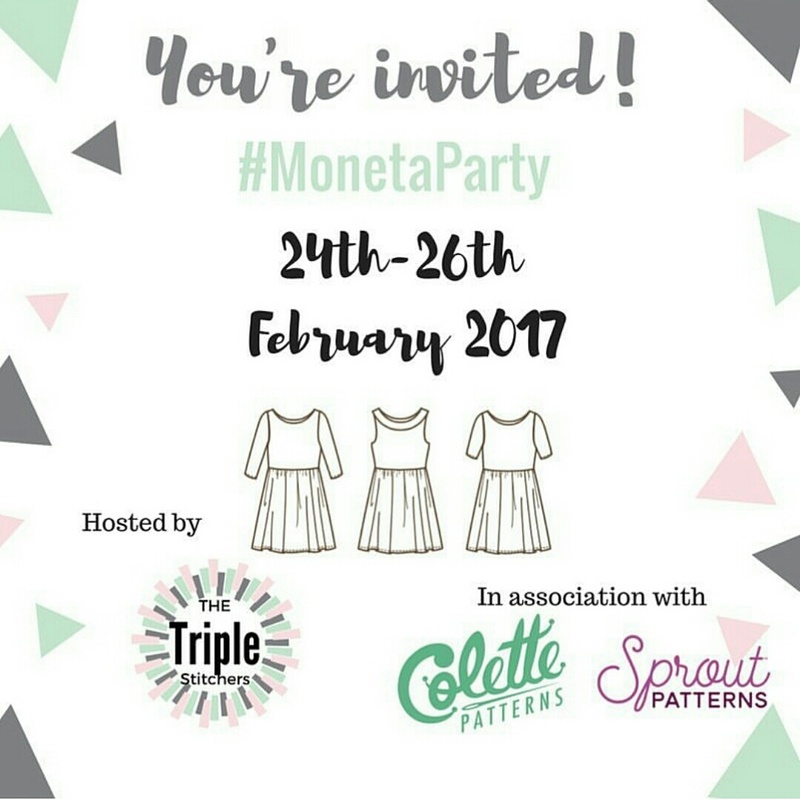 Today is the first day of the Moneta party which is taking place on istagram!! Yay!! What is this party? It is an on line party, organised by Triple Stitchers (@sewpositivity, @rach_wain and @sewabigail). 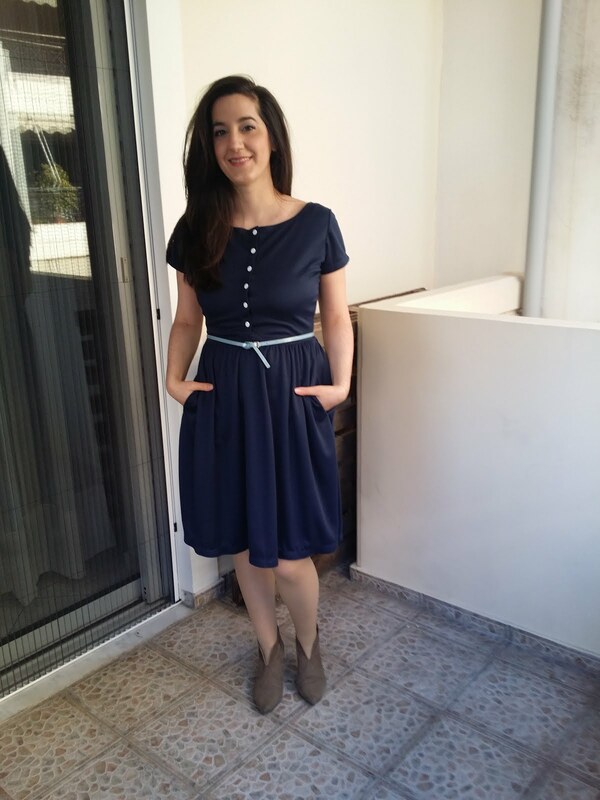 These girls announced the upcoming party last month and all we had to do (anyone who wanted to participate) was to sew a Moneta dress and come join the party! The revelling day of the dresses is 24th-26th of February ’17. There are a few sponsonrs to this party, who will choose their favourites dresses and then they will give amazing prizes!! Woo-woo! 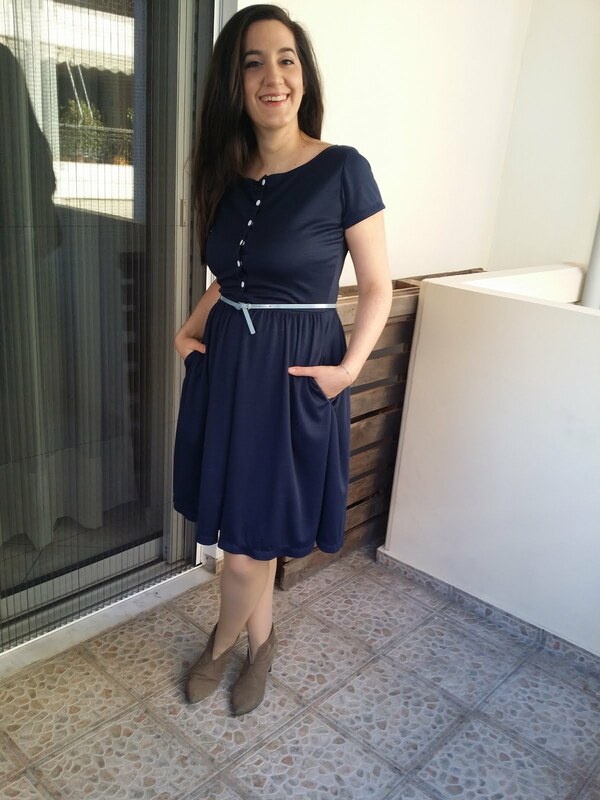 Moneta is a dress pattern by Colette patterns. It is a knit dress with 3 variations. It has a wide neckline (like a boat neckline), fitted bodice and a shirred skirt with in-seam pockets. 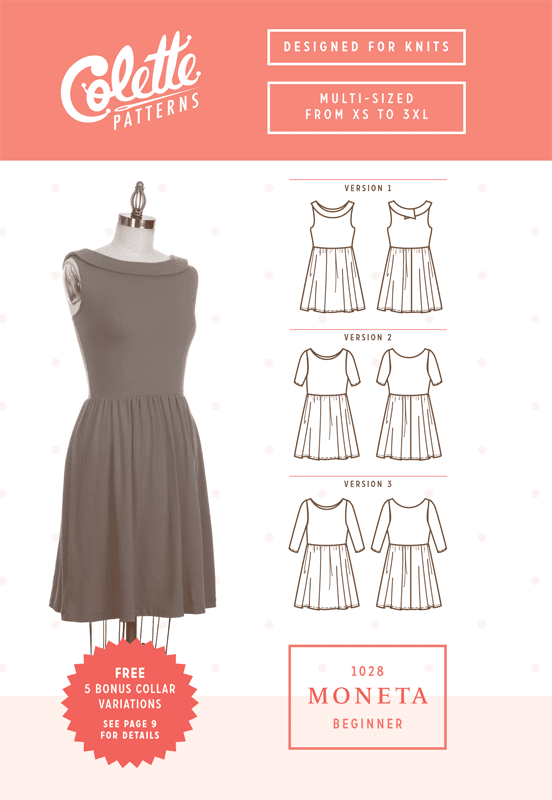 Version 1 is a sleeveless dress, with lined bodice and a round collar. 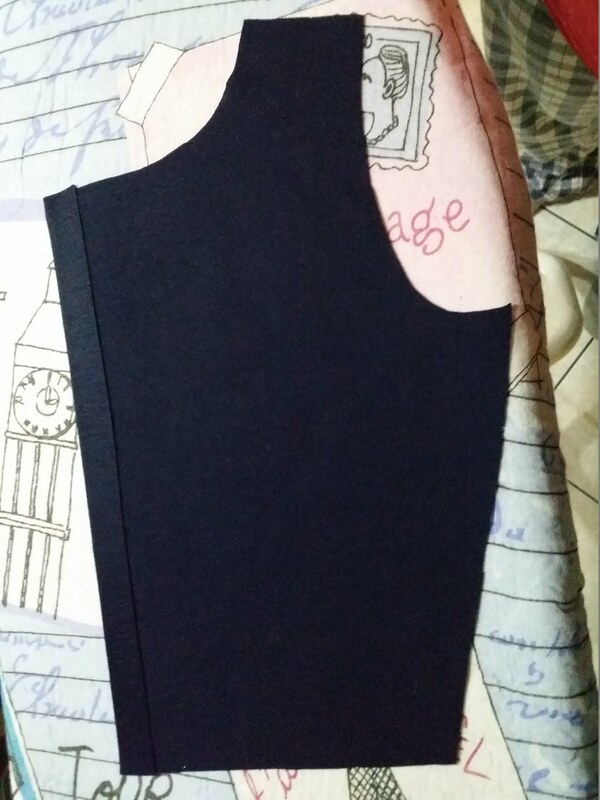 Version 2 has an unlined bodice and short sleeves while version 3 has also unlined bodice and 3/4 sleeves. As far as the difficulty of the pattern is concerned, the pattern is labelled as a “beginner” according to the company. The pattern requires ~2,5 meters of knit fabric for size M which I made. I chose a navy blue ponte fabric from Tsagrinos and I bought it for 3 euros/meter. The fabric has a slight seen on it. 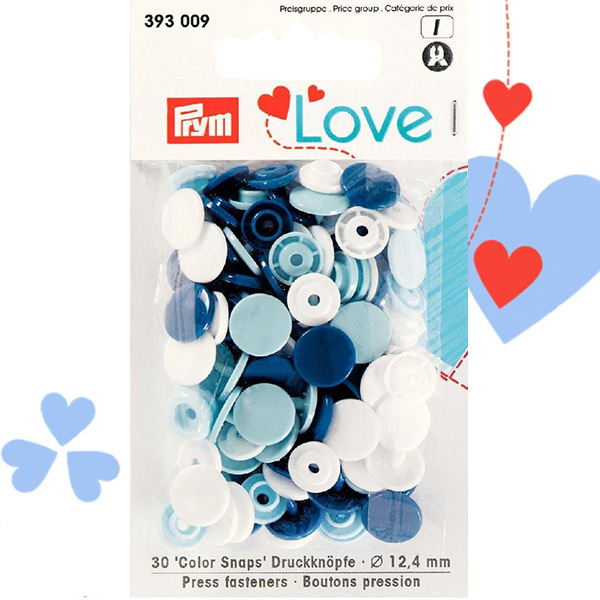 For the front closure I used Prym plastic snaps from the Love collection in baby blue which I purchased from raftadiko for 2,90 euros per pack. 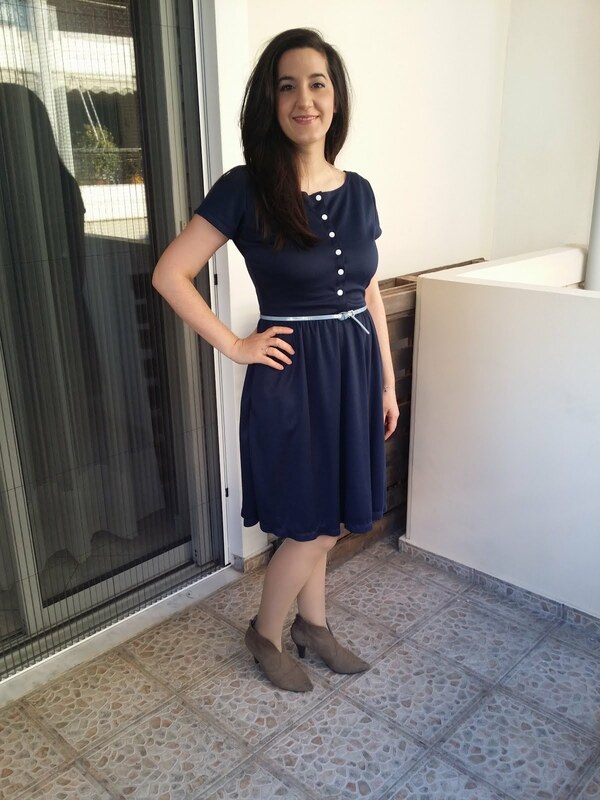 Moneta is the first Colette pattern that I have ever made. I have the pattern in pdf which was a Santa gift last Xmas! I decided to stick the pdf pages together using glue stick instead of using sellotape so I could see which way is better. I ended up with a pretty much wavy paper pattern. So, in the future I plan to continue sticking my pdfs using sellotape! On to the dress now. I made size M like I mentioned before. I was between sizes at the bust area. I could go for a bigger size at the bust but I decided to go for the smaller one in order to continue wearing it when I’m going to return to my previous size. While breastfeeding you are not actually sure about your bust size. I could definitely go for bigger size at the bust! As always, I used clear elastic in order to stabilise the shoulder seams. Also, I used clear elastic according to the pattern instructions for the skirt gathering. It was not only a super quick process and way better than sewing it with long stitch and gather it with hands but also you ended up with a skirt that it actually has elasticity! Really important! 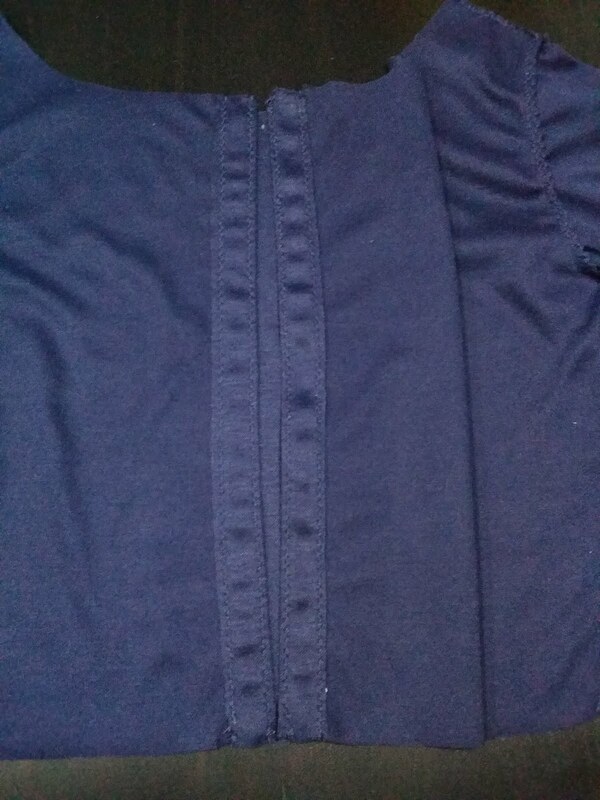 I used zic-zac stitch (2,5 width & 2,5 length) to the entire garment and also for the hem. I didn’t use twin needle at all. 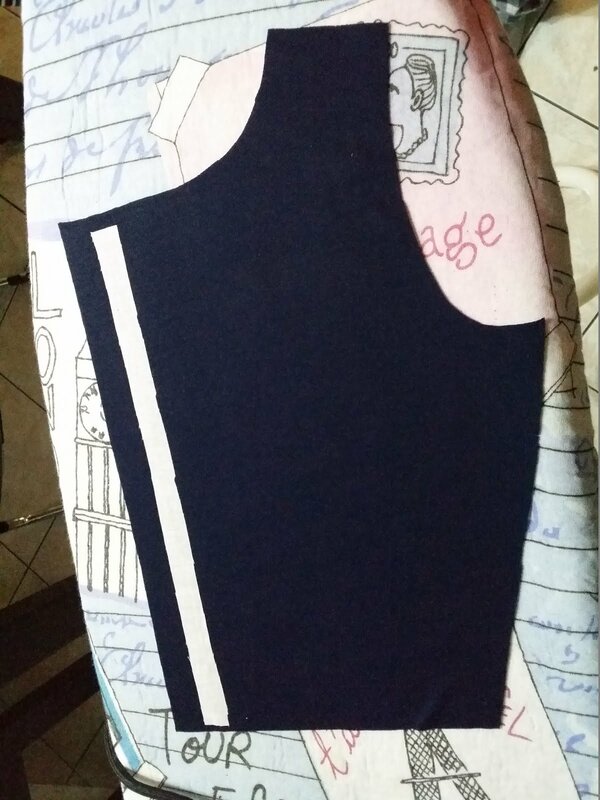 First, I took the front pattern piece, I added 5cm at the middle and I cut it on fold as the pattern requires. Then, I cut the front piece in the middle so I had two front separate pieces (one left and one right) that they looked alike. 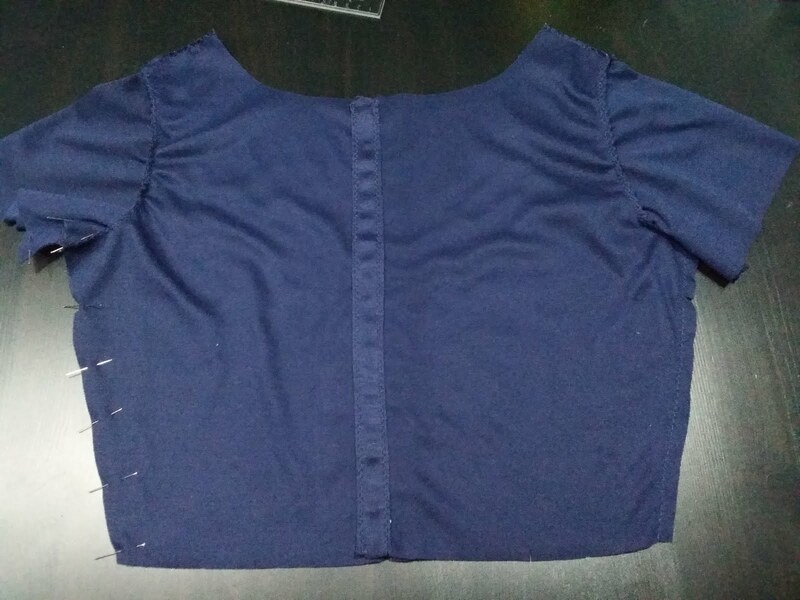 To make the button band stiffer, I used mid weight knit fusible interfacing and I cut a long strip of the interfacing about 2cm*29cm long. I interfaced the front piece along the button band (2,5cm from the front edge), I folded it about 2,5cm and I secured it in place using zic-zac stitch (2,5 width & 2,5 length stitch). I top stitched the button band at the long side of it 0,3cm and also 2cm from the front edge. Next, I repeated the process for the other front piece as well. 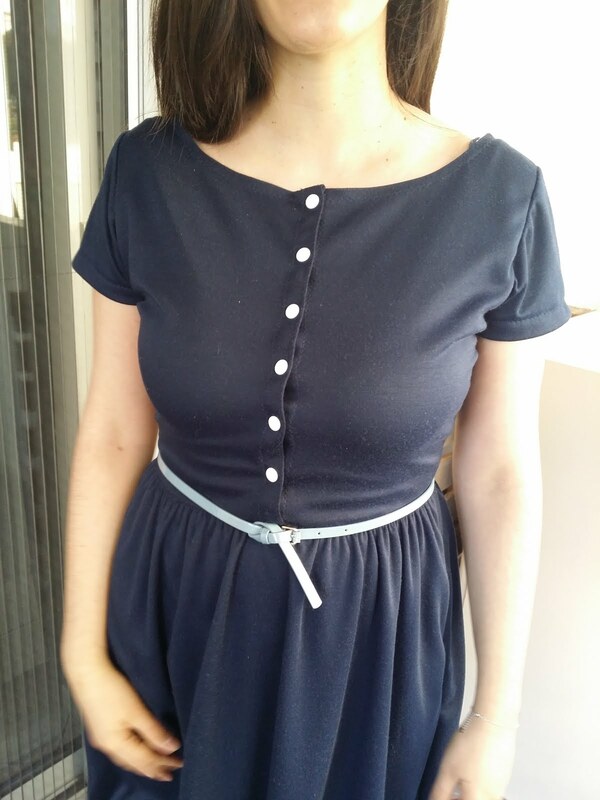 To continue, I overlapped the two button bands and I attached the skirt to the bodice. Finally, I estimated how many snaps I would like my dress to have and I measured properly the distance between them using a ruler. I attached the snaps using Prym’s tool and…Voila! 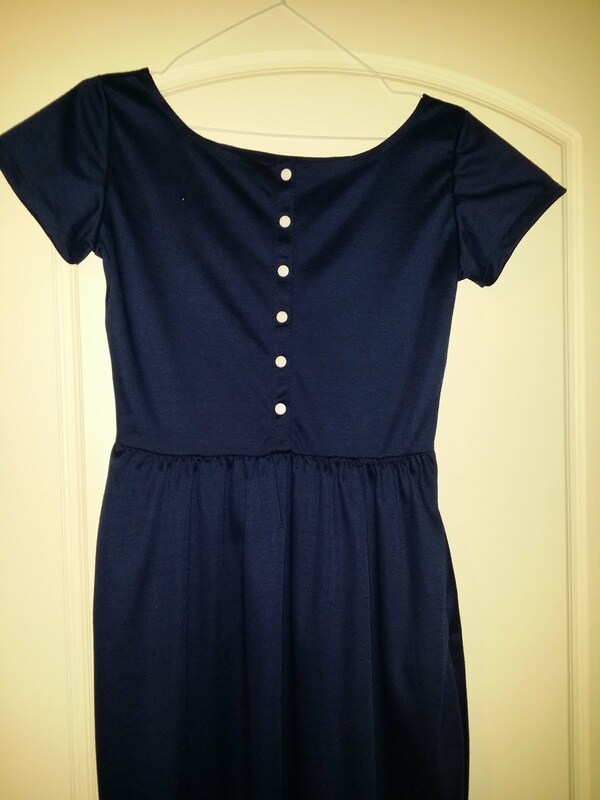 Finished button band, Finished Moneta! Hooray! I am so pleased about this make! It is so comfortable dress and I love that it has pockets! It is totally my cup of tea and I plan to make another one for the upcoming Spring-Summer! This time I plan to make a flowery one! If you haven’t make one yet, I totally recommend this pattern to you. It is easy, beginner friendly pattern and super comfy! Make another one? Totally! I plan to make one for Spring!